The World Scholar’s Cup (WSC), an international team academic tournament, aims to motivate students of all backgrounds to discover new strengths and practice new skills. 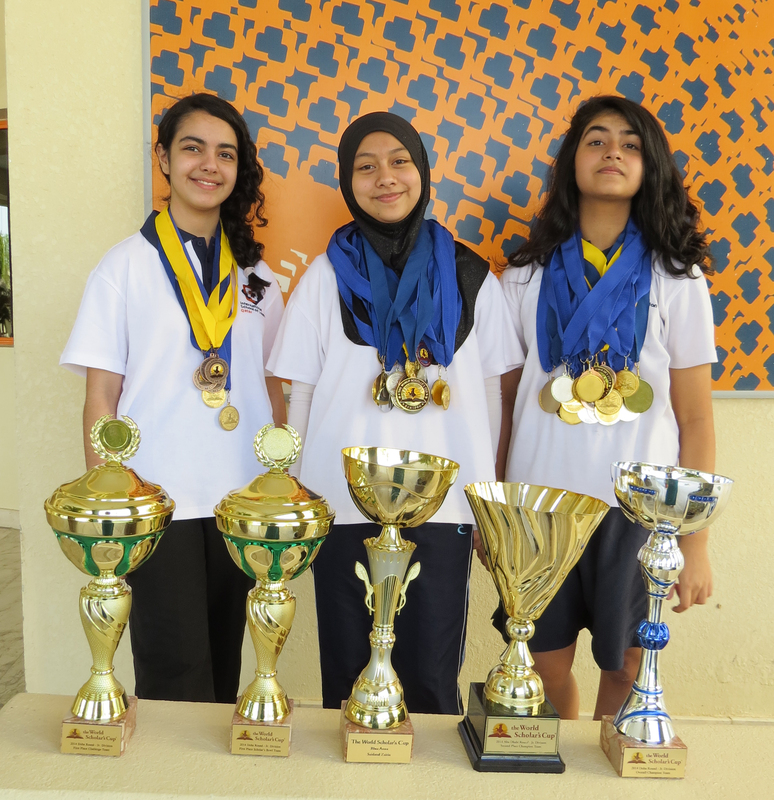 Middle Years Programme (MYP) students Rhea Arora, Saidatul Zairin and Salma Tuffaha from The International School London (ISL) in Qatar, are preparing for the final “Tournament of Champions”. They tell us about their achievement so far, how their IB studies prepared them for the challenge and how much fun they had. 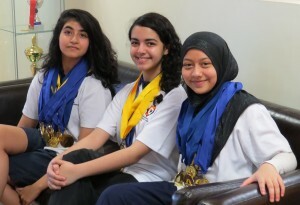 From left: Rhea, Salma and Saidatul are finalists in the World Scholars Cup. Rhea: In the Abu Dhabi regional round, Saidatul and I achieved second place overall and won 14 medals and 2 trophies. We then teamed up with Salma as our third member to participate in the introductory regional round in Doha, Qatar. Here, we did even better, winning 3 trophies and 25 medals collectively and were placed 1st overall. In both rounds, we managed to qualify for the globals in Singapore in June. Although we didn’t do as well in Singapore as we had in the regionals, we still managed to qualify for the Tournament of Champions at Yale, US in November. We are now busy preparing for the next round! What inspired you to take part in the World Scholar’s Cup? Rhea: The Worlds Scholar’s Cup was introduced to all ISL Qatar students by watching videos of previous WSCs during assembly. It seemed to combine academic challenge with good fun and I felt personally inspired by the uniqueness of the event. I also was inspired by the enthusiasm of the student competitors for subjects that were genuinely interesting, topics that would not normally be covered in school. The prestige of the event and the locations in which they were held were also motivating factors for taking part. Saidatul: What really inspired me to take part in the WSC was actually an article that my team-mate found, written by a WSC competitor who had competed in previous years. By the time we discovered the article, we had already signed up, but until reading that article we thought of it as just another competition. Reading about the student’s experience—the friends he made there, the knowledge he gained and what WSC is really all about—we realized how fun it would actually be. My family also deserve a lot of credit for supporting me in taking part. Salma: I heard about what the WSC offered and the activities that would take place in the rounds from Rhea and Saidatul when they came back from Abu Dhabi. I immediately wanted to take part and joined the team. It seemed like a great learning opportunity. How did your MYP studies help you to prepare? Rhea: They certainly helped. A chief component of IB programmes is to “apply your knowledge”. This was key in the World Scholar’s Cup. Throughout the events—which included debates, collaborative writing, the scholar’s challenge (multiple choice test) or the Scholar’s Bowl (quiz)—a particular requirement was to apply the information from the material researched to a given task. A major link between my MYP studies and WSC was the idea of understanding rather than cramming, I would even say that this was perhaps one of the most important parts of the entire programme. Research skills and being able to delve into a topic was also heavily required in the WSC. Fortunately, however, it was one we had practiced and improved upon through our IB studies. Saidatul: MYP studies involve a lot of independent learning and I feel that helped in my preparation for WSC because even though there is a WSC club at school, we still do our own research and study independently. Also, over the course of this year, we have had lessons on persuasive techniques which came in handy during the collaborative writing challenge and debate. Salma: I agree that MYP studies involve a lot of independent learning and I feel that helped in my preparation for WSC because even though there is a WSC club at school, we still do our own research and study independently. Also, over the course of this year, we have had lessons on persuasive techniques which came in handy during the collaborative writing challenge and debate. Which of the IB Learner Profile attributes did you demonstrate the most during your WSC experience? Rhea: It is incredibly difficult to pick just a few IB Learner Profile attributes that we may have demonstrated during the WSC. We were open-minded, knowledgeable, thinkers, but more importantly, risk-takers, inquirers and communicators. With each progression, there came more uncertainty, we did not know how to best prepare, but we did know the standard of our competition around the world. We approached each task and each challenge with determination to do well. We travelled to different countries in this journey with some doubt at first, but we worked together to face any problems. We took part with enthusiasm and curiosity. We expressed ourselves persuasively and collaborated in research and communication to move forward as a team. Risk-taker – because this is a completely new experience for me, for all of us actually, and we’ve all decided to try to participate even though we knew there was going to be a lot of work. Open-minded – during the whole WSC experience, I needed to be open-minded to the culture and language of participants from 40 different countries and be able to work with them regardless of their background. Knowledgeable – This is probably the most important IB Learner Profile needed for this competition because we needed to know many things in many different areas and understand issues that effect us globally. Salma: We were certainly thinkers and inquirers, as we all had to think critically and look for information beyond the facts given to us. We were also very open-minded as we had to be open to other opinions and look at many different points of views when debating and writing. On reflection, what did you enjoy most about taking part? Rhea: I really enjoyed the experience as a whole. The passion for learning that each person—students and staff—displayed, was inspiring. I enjoyed the academic events, for example the Scholars’ Bowl, Debate, and the social events like the Scholar’s Ball. It was great to have the opportunity to meet so many people from diverse cultures and learn so much. Of course we cannot deny how much we enjoyed being awarded too, and the progress we made through each round – it gave all of us a confident boost. Travelling with friends was also a bonus! Saidatul: I enjoyed a lot of things while taking part! … travelling to Abu Dhabi and Singapore, the Talent Show held at the Global Round, and I definitely enjoyed having all those medals put around my neck. But I think what I enjoyed the most was the debating and the quiz during the competition itself. I loved all the debates, even though I’m still working on my debating skills. I learned how to stand up for an opinion and be persuasive even if it’s not my opinion. As for the quiz, it’s nerve-wrecking and you’re racing against time, interrogating your team-mate about whether she’s sure that her choice is right! That was the most exciting part. Salma: I really loved the learning experience. Not only did we learn about new subjects, such as espionage and decision-aking, but we learned how to develop our way of studying and many different skills such as debating. What are your top five tips for other MYP students around the world who might consider taking part? Keep studying. You can always go deeper into the information. The deeper you delve into each category, the more beneficial it will be for you in the long run. Choose the right team-mates, people with whom you can collaborate and communicate efficiently. After all, the WSC works in teams of three. Team work is key. Apply your knowledge. Remember chief facts are important, but it is equally important to understand the concepts. Keep practicing the skills needed to debate and write persuasively. How and what you say/write is most important. Lastly, have fun! Maintain the desire to win and achieve but always make the most of each experience. You will certainly miss the program when it ends. Don’t overthink it – if you’re having indecisive thoughts about whether you want to take part or not, my advice is to give it a shot! Pick good team-mates – choose people who you can “gel well” with. Don’t panic – yes, there are a lot of topics to cover and time is limited but panicking did not help me. Don’t procrastinate – as I have mentioned before, there are a lot of topics that need to be covered so procrastinating is obviously going to lead to a lot of problems – and I’m saying this from a procrastinator’s point of view. Have fun! – why not? Work as a team. Help and advise each other. After all, it’s better to be criticized by someone who really cares about you rather than someone you barely know! Practice debates and writing with your coach and any other teams from your school. The only way to really get better, is to practice. Also try to find videos of others debating, preferably someone close to your age. You can find what makes them such strong debaters, and use those skills yourself. Manage your time well. You may not retain all the information properly if you leave it all until the last minute. You will have plenty of time to study between one round and the next. Spread all the studying out, and you will be fine. Keep calm. Try not to get nervous. If you do, you may panic and make silly mistakes. If you studied, practiced, and know all the material; you will be fine.